← Monday Question – Do You Ever Go Without Perfume? On a more fragrance-oriented note, at the moment I’m still suffering from acute perfume fidelity syndrome, which means I am sticking it out with my L’Ambre de Merveilles. Such a show of loyalty going on for almost four weeks now, is unprecedented and slightly worrisome. Does it mean I’m over perfume? Do I only want one perfume for the rest of my days? What would that mean for my collection? I’m looking at my Guerlains, my MdO’s, my Chanels, my most precious juices and – watch out for perfume heresy!!! – I’m left cold. Day after day, I find myself turning away from my perfume closet and reaching for my bottle of L’Ambre with a sense of deep contentment and a little defiance. It could mean I have matured all of a sudden and without any apparent reason (yeah, sure). It could mean that I have found THE ONE and that is that. It could just be a phase (and God knows, of those I had many in my life). It could mean I’m a bit out of sorts still, physically and emotionally, for various reasons. It could mean I have gone off perfume forever. It could also mean absolutely nothing. Time will tell. For now, my dear fragrant friends, I’m going to live vicariously through you. What is your scent of the day today? Why did you choose it? This entry was posted in Hermès, Ramblings and tagged cooking, Hermes, L, LAmbre de Merveilles, Perfume, Thanksgiving, Turducken. Bookmark the permalink. Gluten free? Are you gluten intolerant? I’m constantly wearing Yosh White Flowers, and all my other perfumes are getting little to no love. I don’t adore it anymore, it just feels so comfortable. I have almost completely stopped sampling, and I find this very depressing. I too, hope this is a phase. Hope you are well! Cant wait til the new year, so I can get back into blogging and reading other people’s blogs more! Oh, testing Une Voix Noire today. Loved it yesterday, today I feel like I’m in a kids’ room. It’s not my cup of tea either, but I have to say I did only try it once so far, so you never know. I understand the slump you are in. I find myself reaching for comfort scents only. The dreary grey skies and impending winter are to blame in my case. Phases like these are good to have because then we can enjoy everything we already have even more. I am wearing Lira today. You smell lovely with your Hermes! Enjoy the slump. I am enjoying it – for the most part at least. You smell wonderful in Lira, it’s perfect for the weather. “Acute perfume fidelity syndrome” – priceless! I have yet to try the offending Hermes, but have high hopes of being similarly struck down by this and its related syndrome “sudden onset perfume inertia”. I have found myself forgetting to – or deliberately choosing not to – wear perfume lately, which the loss of the cat has a lot to do with, but otherwise seem to be broadly as much of a multi-toggler as I ever was. Maybe the Hermès will have a similar calming effect on you, it is the most comforting perfume ever. Hugs. Which two OJ’s are so good? And how mich are they? I’m experiencing a series of acute perfume fidelity phases: be it carnal flower or Shalimar (Shalimar is a recurrent sympton of my peculiar syndrome), I have worn each for more than 10 days in a row this fall. It also happened las year (with the Guerlain). I think these phases are great. They signify contentment and you get more satisfaction in the variety of your own collection once the allure of perfume-monogomy wears off. Besides, your syndrome allows to avoid serious mishaps: today I tested broadway nite (I wanted to explore rose + violet perfumes, and the Bond was a recurring suggestion), and what I smell is just a HUGE violet leaf (no violet flowers at all!!! ), searingly clean and horrid. Maybe my sample was mislabeled, but oh how I wish I have stayed within the satisfying and fulfilling boundaries of my Shalimar ode a la vanille. Enjoy your ambre des merveilles. Thank you for this lovely and re-assuring comment, Zazie! I’ll jist enjoy the phase and whatever happens, happens. Dear Birgit, I’m so happy but not surprised your meal was a success. Myself, I’ve been to a Thanksgiving party on Saturday evening, my first one, at my american cousins’s home who are in Paris for two weeks, I didn’t know it was possible to eat so many things and so different things on a same plate!!! Delicious and a wonderful moment. I understand what you feel just now about perfumes, I cross the same phase but with two scents: Ambre Russe by Parfums d’Empire and Orris Noir by OJ. I can’t get enough. I’m just a bit surprised by Ambre des Merveilles. Sure it’s a wonderful scent, I made a blind buy in Hermès store at Deauville, this summer and after a few sprays, I realized it made me sick…..
First, it doesn’t smell a lot on me, and it’s heady, well, really, the bottle is beautiful, the color of the juice is amazing but I can’t stand it and I’m very disappointed by this. Well, if you want a second bottle, let me know. I’m glad you had such a nice Thanksgiving dinner too, Florence. It is a beautiful tradition. Well done to you and your husband on the meal. Haven’t tried turducken yet. My choice today was Musc Ravageur. No real reason, but I find it does wear beautifully in slightly warmer Sydney weather. I so understand how you feel. It doesn’t last long for me though. What I am finding though is that I keep revisiting the same scents, which is helping me sort out what’s really prized as a full bottle in my collection and what I can just keep samples of. Musc Ravageur is a great choice. Thanks for your input, Madeleine! I have scents that I pull out of the drawer and put on the dresser every few months. Those are the ones that I’m really in the mood for and think I’ll wear often due to weather, season, etc. Often I end up reaching for one more than the others for a while. I think it’s a normal phase to want to wear just one and I think that’s what all of us wish for, that we could actually find a scent that keeps up happy for an extended period and not just until the base notes fade away. Maybe not a signature scent but something that feels right for a time. Perhaps it’s like your fragrance version of a great, comfy fall sweater that you just want to wear all season long. Glad the turducken was a success! It looked good. It is probably a seasonal phenomenon, we’ll see. Thanks for the encouragement, Poodle! Wow! The Turducken looks amazing, lunch is still hours away but that has made me peckish! Thanks for the compliment on the Turducken, I’m very proud of my husband’s cooking skills. 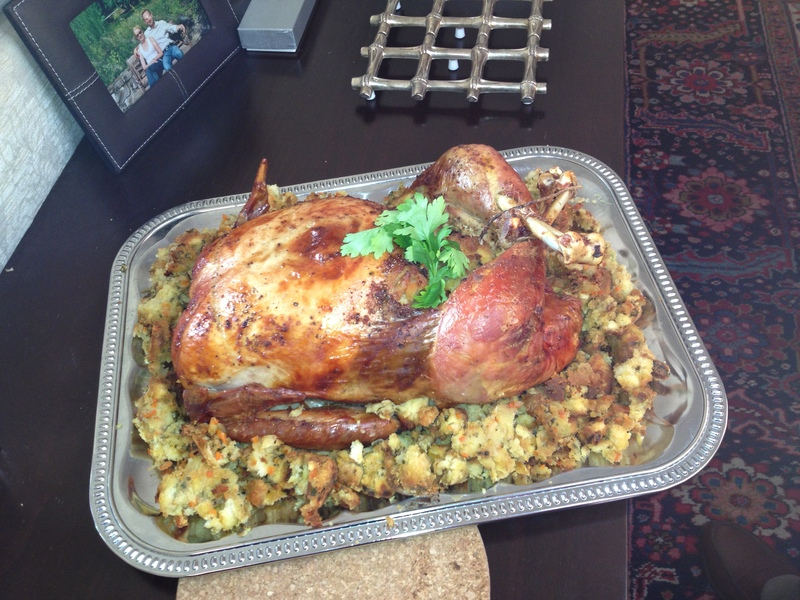 Still curious : for how long did you keep the glorious “turducken” in the oven ? Unfortunately, this seems to happen to all of us. Last winter I wore all together 3 perfumes because each morning I didn’t feel like wearing anything else. But now I am thoroughly intrigued by this Amber! To make you crave it so much, and being a Merveilles flanker, I am scared the same thing might happen to me. That is very reassuring to hear, thank you Ines. I’ve been wearing my first everyday perfume love, Hanae Mori’s Magical Moon, for nearly 2 weeks. (My first special perfume love was vintage Mitsy.) But today, for some reason, I wanted to wear Andy Tauer’s Pentachords White, the strange alien marshmallow scent. I was just craving it. Will I go back to Magical Moon? Is my Hanae Mori phase over? For how long will I smell like the Staypuft Marshmallow Man from Ghostbusters? The suspense! You are right, just go with the flow is best. I rather like your description of White, very apt. Per your recent recommendation, Birgit, I got some Le Ambre de Merv. I understand your “acute fidelity!” It’s gorgeous, and just right for the season. It almost harkens to a very popular flavor for sweets and coffees right now – salted caramel. Have faith, I think we all go into phases when we love something. I probably spent most of the summer in SSS’s Jour Ensolielle. And I only sleep in L’Heure Bleue. Every night. Glad you like L’Ambre too, Nina! It’s so romantic that you sleep in L’Heure Bleue every night. Oh, I’d been dying to know how the turducken turned out. Like Ines, I was rather skeptical, but I should have guessed that in Mr. OT’s hands, it would turn out all delicious and beautiful. I wouldn’t worry too much over your current monogamous perfume stage. I think it will pass, but if it doesn’t, then you become a signature scent kind of woman and enjoy writing about other things. But I do think it will pass … probably when you’re walking down the street and catch another woman’s exquisite sillage. It will make you remember all the beauties awaiting you in your perfume cabinet. My scent of the day is going to be Opus V. I’m in the mood for sensual, masculine-leaning perfumes right now. There’s something that feels protective about wearing that one, too. Opus V suits you well, Suz. Just roll with it. : ). You are probably going to refine your collection. We are always seeking balance, and there is no exception in the perfume world. You have to swing to the other side to see where you want to be. Here is something that is interesting. I was spending some time with my friend over thanksgiving holiday. She moved away about 5 years ago : ( , but comes back to Memphis once a year, or so, because here parents are here. She and her daughter always used to comment on my scent, and how much they loved it. I always have a base of sandalwood and often peru balsam that I mix, on my skin, then I go for the perfume, which is not the same as when they lived here. Arline, I could smell your scent from downstairs!!!!! And I thought “REALLY”??? I was wearing Champagne du bois, which I just started wearing. I don’t know if that made sense, but I thought it was cool, and it made me smile!! Do more interviews, you are good at them. : ). What a lovely story, Arline. You are truly making every perfume your own. I’ll think about the interview thing, contrary to you, I don’t think I do that well at all, but your compliment is very helpful. I’m glad you enjoy L’Eau d’Hiver. Ellena always works for me, no matter what. OMG!! Go see a doctor please Birgit! If he prescribes severe bottle rationing I will be in Vienna in a few weeks and will happily help you cull your collection into a parcel post pack. I will, Portia! Medical attention seems imperative. Do you have your itinerary already? I would hate to miss you when sou are in Vienna, so as soon as you know the exact dates, let me know please! 31 RC is a great scent to be associated with. Everything said and done, I popped into Sephora on the way home from my morning run. (My husband does not think it’s such an asset to live a 5 minute jog from the local shopping center.) The lovely associates there made a sample of L’Ambre de Merveilles for me. I am SO glad I did not have any money or credit cards with me. After the really sweet orange opening, this turned into the yummiest amber ever. I wanted it on the spot. Now I must restrain myself until I’ve used up the sample. (My silly perfume shopping rules to keep me from spontaneous regrets.) Sorry, but I can totally see why you want to wear this every day, especially in the cool to cold fall weather. It is very appropriate for the weather and the holiday mood. It’s very comforting and uplifting at the same time. Although, I think come spring with warmer weather you will want to wear something different, so don’t be too quick to downsize your lovely collection. Ah, 31 RC…. Just got a bottle, and interestingly, my kids like it on me too. Absolutely beautiful turducken!!!! Oh my, that makes me salivate. Looks absolutely wonderful. Your husband must be so pleased! Fils de Dieu is lovely, I can see why you stick with it. I’m sure you’ll be back to perfume variety soon! Well, you have been posting about wanting to find a signature scent for a while now, so maybe your call to the universe was heard. Or, maybe you just want a moment to center, without feeling driven to sniff more, more, more! and when you come back to a little interest in variety again, it will be more on your terms. If it is the former, do you have any other interests that you may want to blog about? You were a dancer, a dance blog would be fun and beautiful. Or knitting? A blog on knitting would be great, the more remedial the better (so I can play, too):). My scent of the day is MDO’s Oud, which I have been wearing about three times a week for the past couple of weeks. For me, that is near fidelity. Yes, I’ve felt this coming on for a while now, and of course I post what is on my mind. Did you have to cook the chicken and the duck before you stuffed the into the turkey? This sounds kind of tastey as long as I knew I wouldn’t get sick (which means that a doctor is probably the only non-professional chef who’s turducken I would think of eating without fear). Anyway, Happy Thanksgiving! No, the birds cook together. They are in the oven for a long time, so there is no risk of salmonella or the like. I have been unusually faithful to Love and Tears and Ambre Russe but just placed a huge sample order from SSS (fastest order fulfillment ever!) and am sure that will broaden my horizons. Oh, have fun with SSS, such beautiful perfumes. I’m sure you’ll find many to love there! At the risk of making a heretical comment, I am wearing Unspoken…it’s very nice, just as Danger is, but I’m not amazed. And it’s sillage is odd, disappearing for hours, and then drifting up to meet me once in awhile. I was surprised, and worry, does this mean I need to drown myself in this stuff to enjoy it? At those prices? I would have thoug a Guerlainaholic would have learned how to recreate those magnificent sillages that become not a part of me, but BeCOME me, if that makes sense. I almost wish I could show your fidelity. As I love amber, I can certainly understand your love. Roll with it. By warm weather, those notes may not be what appeals to you, or perhaps they will. You can share other stories with us, like your turducken adventure, and your travel stories! Maybe you are anosmic to something in Unspoken? I never experienced the wavering sillage, it is a steady presence on me for hours. Maybe it is also a winter thing. I am only wearing SS Annunziata’s Vaniglia del Madagascar and Borneo 1834, either separately or in tandem, and nothing else seems possible for me at present. I need my comfort blanket: perhaps Ambre des Merveilles is yours. I need to smell it, though I can’t remember seeing it last time I went to the Hermes boutique in Yokohama. I am, if not totally happy, very content. I enjoy being free, for the moment at least, from the need to want more and more. Free from the need to try this and that and an entire line to boot. That does make me happy for now. You just need some perfume rest. And that is done so that you wear just one wihtout toubling your mind with difficulties of choosing something else. It’s just the down fase of the perfume mania. At least with me ;-). Acute Perfume Fidelity Syndrome- surely a term to be quickly adopted by fragrance fans everywhere 😉 On a non-fragrance note, I have never had turducken. I am guessing I would like it, but haven’t yet had the chance to eat it. I’m sure you would have enjoyed the Turducken, it was delicious.